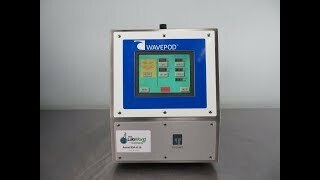 The GE WAVEPOD R1113 controller for the wave bioreactors offers digital, graphic based control with a bright easy to read easy to use touch screen. This control module controls and monitors dissolved oxygen measurement, pH measurement, aeration control and O2/CO2 gas blending. This bioreactor control module has direct connections to a Base20/50EHT, ethernet, alarm contact, 2 pump connections, communications and programing. This bioreactor control module also has inlet and outlet connections for rackpump, sensor port for pH and DOOPT, as well as inlets for CO2 and O2 for mixing. This GE WAVEPOD R1113 controller has been fully inspected and is performing to expectations. All of our lab equipment comes backed withour standard warranty. Should you have any questions, please don't hesitate to contact us.